One of the true icons of Islay distilling, this classic 16 year old malt hails from the south of the island, and brings with it a wealth of history. Indeed, such is the high regard that this whisky is held in, that Diageo (then United Distillers) picked it out as the Islay representative in their “Classic Malts” series. Slow distilled in large pear shaped distills, the whisky has a dense, oily character, which makes it the ideal digestif. Indeed, Lagavulin has been called “the cognac of whiskies”. 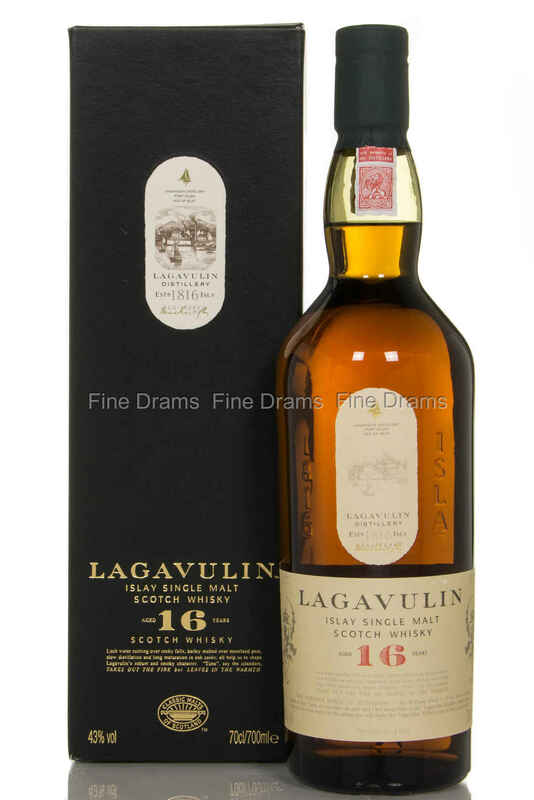 A wonderfully peaty whisky with a good dose of sherry influence, Lagavulin demonstrates superb balance and poise, with notes of fudgy, tarry peat, cigar smoke, lapsang souchong, boiled sweets, dried fruits and charred oak. In contrast to the growing trend of non age stated whiskies, and reduced age statements in standard ranges of many distilleries, Lagavulin’s flagship malt has retained its 16 year old maturity admirably, and to the considerable benefit of the spirit. It is difficult to overstate the quality of this whisky, it is simply a must try. A crucial dram for every peat-head. Nose: sweet soft peat, with plenty of barbecue and burnt oak. Rich sweet sultanas and raisins. Some slight breadiness. Slight drying iodine, with wood spice and stewed tea. Creamy vanilla. Palate: Filling peat. Rich and malty, nice sweet wine and drying dark fruits. Oaky peat with some wood smoke and spice. Finish: Medium, quite spicy with some figs. Overall: A genuine Islay classic, and deservedly so. The extra age here make it really stand out from other “entry level whiskies” adding a delicious layer of vanilla oak creaminess. This remains one of the most masterful examples of good peated sherried whisky. A rewarding and reliable dram.